I recently returned from an almost two week trip to Ecuador. On the second day, I became very aware of communications in Spanish: What?- I asked the breakfast lady what the breakfast foods were; Where? – Where was the nearest bus stop? Do the bus go to a certain location? How much?- How much is the fare? How much is the juice? When? – When does the museum open? ; Etc. I also overheard and participated in many conversations about family, work, school, sports, food, etc. Both the modern language class and the modern language daily life involve communication. How much authentic and purposeful language do modern language students use in the class? How much time do our students spend in learning about the language as opposed to using the language? How prepared are our students for real language interaction, the give and take in the language? How prepared are our students to quickly switch from one topic to another as in a normal conversation such as from family to jobs to hobbies to travel? The learning in our modern language classes has to go beyond book learning to realistic language use even at beginning levels. How much real language interaction takes place in your classroom? At http://bit.ly/tsmash, I have an ebook 90 Mobile Learning Modern Language Activities (mainly speaking and many current culture activities). 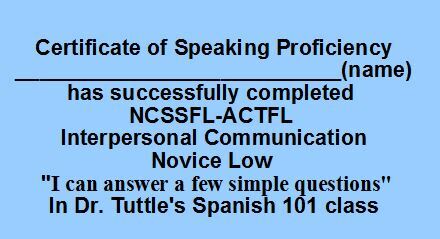 Also, at http://bit.ly/tpthtuttle, I have 5 any language picture speaking activities and 25+ ready-to-use Spanish structured speaking activities for beginning students (including 5 Can-Do ones). At http://bit.ly/tsmash, I have an ebook. Modern Language Proficiencies-Can-Do. At http://bit.ly/tuttlebks, I have a book, Improving Foreign Language Speaking Through Formative Assessment.